Hi All! These are photos, locations and dates for occurences of this type of optical phenomena, also any StreetView example would be warmly welcomed in this forum-thread! North Bay, Canada resident Timothy Joseph Elzinga recently sighted light pillars in the night sky after being awoken by his son in the middle of the night. "Elzinga captured a weather phenomenon called light pillars. Elzinga captured the strange phenomena on his phone taking both pictures and video. You can find a video recap of the event on YouTube. placemark "off-target" again and locates the settlement, not the exact location, what I could not find based on the photos. Explanation: What's happening in the sky? 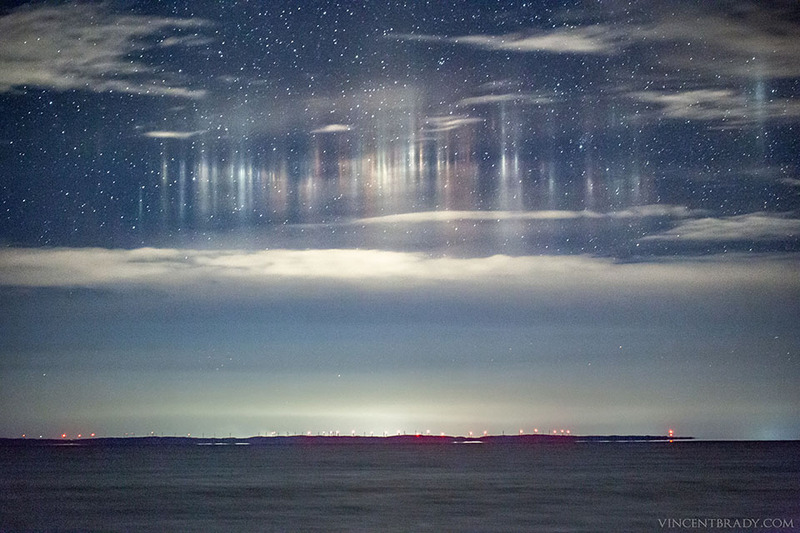 Unusual lights appeared last week to hover above Whitefish Bay on the eastern edge of Lake Superior between the USA and Canada. Unsure of the cause, the Michigan-based astrophotographer switched camera lenses -- from fisheye to telephoto -- and soon realized he was seeing light pillars: vertical lines of light over a ground source that reflect from falling ice crystals. As the ground temperature was above freezing, the flat crystals likely melted as they approached the ground, creating a lower end to the vertical light pillars. The red ground lights originated from wind turbines on Ile Parisienne, a Canadian Island visible across the bay.